A method of construction of a moulded product which includes the steps of impregnating non-metallic fibres in epoxy resin whereby said impregnated fibres may be arranged to form a sheet of said fibres; cutting a plurality of pre-pregs from said sheet; forming successive layers of said pre-pregs so that said layers are arranged in stacked relationship (preferably formed of pre-pregs having fibres arranged in an intersecting orientation which alternate with pre-pregs having fibres arranged in a longitudinal and/or latitudinal orientation) in a mould cavity of a compression mould; compression moulding at elevated temperature; and removing the moulded product from the compression mould. There is also provided a moulded product per se as well as a moulded product formed by the method of construction. The moulded product is preferably a prosthetic device including a J-shaped pylon (11) and sole plate (23). TITLE "METHOD OF CONSTRUCTION OF MOULDED PRODUCTS"
In the past 15 years, there have been an increasing number of lower-limb amputees who have desired to enhance their quality of life by being able to have access to an affordable prosthesis that will provide not only basic mobility but which will also encourage and permit participation in low- to high-impact activities in the same manner as enjoyed by non-amputees. Numerous technological advances in the field of prosthetics have allowed this to happen and have provided a wide range of prosthetic legs to choose from. In coalition with the general type of prosthesis for normal gait activities, such as basic ambulant walking and work type activities, there has been a demand by amputees for prostheses that can enable them to lead a more active lifestyle and, thus, improve their quality of life. There has been much effort within the prosthetic industry to develop a lightweight and durable prosthesis that will allow amputees to participate in strenuous career options, such as laboring, farm work, etc, and various medium- to high-level activities, such as jogging, squash, climbing, tennis, etc, and very high-impact sports, such as running, sprinting, jumping, basketball and volleyball. Numerous different prostheses have been developed, each trying to replicate the function and appearance of the replaced body part. Lower leg prostheses present unique problems. They must be strong enough to support a person's weight and activity level and to withstand the forces encountered through gait movement. As a result, some prostheses developed in the past were very heavy and rigid and restricted the wearer's activity level, career, recreational and sport options. There are a number of different composite foot and leg prosthetic devices that have now been proposed, most of which utilize modern composite material technology to impart energy storage and release during use. Examples of prosthetic foot devices that have been fabricated with composite materials, with the intention of storing energy when the foot is placed on the ground and to release it and provide a lift or thrust as the foot is removed from the ground to aid in the patient's gait are disclosed in Abrogast et al. US Patent No 4,865,612, concerning an artificial foot having a pair of thin forwardly extending spring members connected to a keel and Shorter et al. US Patent No 5,116,383. US Patent No 5,116,383 describes an energy storing foot having a single piece carbon fibre reinforced keel having a lower spring portion connected at its posterior end as a cantilever to an upper ankle mounting portion. The energy storing foot is combined with a resilient ankle joint of the ball and socket type. Phillips US Patent No 4,547,913, 4,822,363 and 5,776,205. An example of the abovementioned lower leg prosthetic device is a prosthesis known as the Flex-Foot, which provides a composite strut and foot configuration, which is specifically described in US Patent No 4,547,913. The spring-like action imparted by the materials used in such devices results in additional mobility and comfort to the wearer. Prior art prosthetic feet that utilize a plurality of springs, such as in Phillips US Patent No 5,776,205, tend to rock under vertical load as the load is distributed separately to the springs. Furthermore, the dynamic feet of the Flex-Foot system that are commercially available, do not have rigid ankle joints. However, this system embodied a rearward separate heel segment or heel portion secured to the main body of the foot, at the mid foot. While this system provides better performance than the former prostheses, this system embraces a plurality of components and joints which are less than optimum for transference of energy from heel strike through to toe-off because of the rearward heel segment deficiency of transmission of continual energy from a separate heel plate through to a separate toe portion on the J-pylon as described in US Patent No 4,822,363 and/or a full sole member described in US Patent No 5,976,191. This is because of the necessity to incorporate additional support members or increase in pylon thickness, which is necessary to provide suitable wearer support and prosthesis performance. Prior art prosthetic feet with a separate heel spring member and/or foam/rubber resilient material placed between foot and sole member tend to absorb vertical load either in the spring member or in the foam/rubber resilient material and, thus, dissipates the transfer of constant energy from heel strike to toe-off. US Patent Nos 4,822,363 and 4,547,913 refer specifically to a J-shaped pylon made from the composite material connected to a flat spring-like rearward heel plate. US Patent No 4,959,073 refers to a J-shaped pylon made from the composite material that is integrally formed with a heel member. Reference also may be made to US Patent No 5,037,444, which refers to a prosthetic foot made from the composite material alternatively known as the so-called "Seattle Foot". These devices make great advances in gait movement and activity levels and have a higher strength and stiffness to weight ratio of graphite to other materials, which results in almost complete return of input or stored energy, lighter weight, higher fatigue strength, and minimal creep. However, these devices also possess some disadvantages. For example, because of the higher strength and stiffness to weight ratio of graphite as compared to other materials, local stiffness, jolting and braking occurs because of material lay-up fabrication methods, which interferes with smooth and even flexing of the components during the wearer's stride. Furthermore, while substantially lighter in weight, they have an inherent rigidity because of the higher tensile strength resulting in greater stiffness to weight ratio of graphite to other material and also have areas more prone to fatigue stress failure. (d) It was considered important to achieve a gradual reduction in the thickness of the pylon in the various dynamic areas thereof such that the foot portion is reduced in thickness compared to the ankle portion, and the ankle portion is reduced in thickness compared to the shin portion. The number of plies or laminations or layers varies in the different sections. As a consequence of (a), (b), (c) and (d) above, it was a general expectation from conventional methods of construction of prostheses as described above that, depending on the foot size and strength needed in a particular prosthesis, the number of plies employed can be increased or decreased as required. For example, fewer laminations may be required for a smaller prosthesis, or a prosthesis for a lightweight individual. A larger prosthesis, or a prosthesis for a heavier individual, may require more laminations. It was considered generally desirable to employ as few laminations as are needed for strength and stiffness to keep the prosthesis as light weight as practicable. (a) impregnating non-metallic fibres in epoxy resin, whereby said impregnated fibres may be arranged to form a sheet of said fibres. (e) removing the moulded product from the compression mould. In step (a) although the sheet can be produced by either solution drum winding or a hot melt technique as hereinafter described, it is preferable to use the drum winding technique so as to provide an intermediate composite sheet formed of the fibres supported on a sheet of release paper, whereby upon removal of the release paper, the final sheet formed by step (a) is obtained after cutting the intermediate sheet as it is supported on the drum. Preferably all of the fibres in the sheet are oriented in the same or similar direction and thus may be described as unidirectional (UD). In an alternative hot melt technique which may be used instead of the solution drum winding as described above in step (a) the pre-preg formed using said technique has fibers that are continuous and that are laid onto a continuous sheet of release paper after the hot melt resin impregnation. These hot melt unidirectional pre-pregs can be stored in rolls of e.g. 75m, 100m , 150m or 200m per roll. A significant difference between drum wound UD pre-preg and hot melt UD pre-preg is in the longitudinal length of these pre-pregs. The longitudinal length of drum wound UD pre-preg is determined by the circumference of the drum (eg. a drum with 1.90m circumference can only produce a UD pre-preg of 1.90m) whereas hot melt UD is continuous longitudinally and available in rolls of 75m, 100m, 150mm or 200mm per roll as referred to above. Preferably in step (b) the pre-pregs have at least some and more preferably all of their fibres arranged in a longitudinal, latitudinal or intersecting orientation. The intermediate sheet may be cut at a variety of different angles so as to provide the pre-pregs of intersecting fibres and such angles may be 15°, 22 °, 30°, 45° or 60° or any other suitable angle so that the final sheet has sloping sides having the desired angle to vertical. Then the final sheet may be folded back upon itself so as to form a pre- preg or laminate sheet having intersecting fibres from which the pre-pregs may be cut out as hereinafter described. These pre-pregs may be alternated with pre-pregs that have each of the fibres arranged longitudinally or latitudinally to each other and which may be formed by the drum winding technique as discussed above so as to provide a final sheet which may be in the shape of a rectangle or square. Thus, pre-pregs having the longitudinally or latitudinally oriented fibres may then be cut out from the final sheet. The cutting of the intermediate sheet as described above may be carried out by cutting lines or grooves which are formed on an outer surface of the drum and arranged at the desired angle, e.g. 0° for forming pre-pregs of longitudinally or latitudinally arranged fibres and 60° or 45° for forming pre-pregs of intersecting fibres. the hot melt technique the desired angles (say 15°, 221/2°, 30°, 45° or 60 degrees) will have to be cut physically on the pre-preg sheets. The method of construction of the invention allows the fabrication of a lightweight, inexpensive moulded product such as a prosthetic device made of composite material for amputees and, more particularly, to an improved lower limb prosthesis. Such a moulding method is effective for overcoming the limitations in the strength, dynamic endurance, weight problems of fibreglass and the stiffness/rigidity and fatigue limitations of prior art methods described above. The method of construction of the invention using non- metallic fibres in combination with an epoxy resin ensures that all individual fibres are impregnated to allow better dynamic endurance and a reduction in weight and thickness whilst retaining the natural flexibility and response of its fibres to allow the prosthesis to have a smoother transition from heel strike through to toe-off. Another advantage is that it allows better shock dispersion of the resilient constructed matrix that dissipates loads during heel strike. While the device of the present invention is preferably constructed of epoxy resin reinforced with laminates of carbon and/or glass fibres, it may be constructed of other non-metallic fibres such as aramid fibre, or recently developed synthetic fibres. The present invention in another aspect, refers to a moulded product characterized in that said moulded product is formed from composite materials having layers of non-metallic fibres impregnated with an epoxy thermosetting resin, characterized in that said moulded product is formed at least partly from layers of said fibres wherein at least some of the fibres are arranged in an intersecting orientation. Preferably the moulded product is a pylon which suitably is J shaped. Preferably, said pylon, at least in outer extremities thereof having regard to a lateral dimension or thickness of the pylon, is formed from a laminate of alternating layer(s) of said intersecting fibres with some layer(s) of said fibres arranged in longitudinal and latitudinal orientation. The moulded product may also comprise a prosthetic device comprising the J-shaped pylon in combination with a sole plate wherein the sole plate incorporates an anterior toe section and posterior heel section. The sole plate may also be formed from the same composite material as the J-shaped pylon. The moulded product may also comprise the sole plate per se. The J-shaped pylon may have an upper shin mounting portion, a lower shin portion and an ankle zone. The ankle zone may taper in thickness from an upper part adjacent to the lower shin portion towards a lower end of the ankle zone. The upper shin mounting portion, preferably has a substantially constant thickness and width. The lower shin portion may have a width or lateral dimension that diverges outwardly as it approaches the ankle zone. The ankle zone, at or approaching a lower or free end thereof, may have a slight concave curvature. Preferably, the sole plate is of substantial width compared to the ankle zone. It may comprise a heel portion and a toe portion. Preferably, the heel portion has a complementary or corresponding curvature to the ankle zone where they abut with each other. A resilient sole pad may be affixed to an underside of the sole plate in any suitable manner, eg by adhesive or the use of fasteners. Preferably, the sole plate is capable of being mounted to the underside of the ankle zone at a designated point of 90 to110mm from a toe end of the sole plate. Through the provision of two sole plates, it allows for the plurality of foot sizing ranging from 23cm-30cm. Suitably, for this purpose, the sole plate and ankle zone may be provided with holes which may be aligned to receive fasteners, such as bolts, there through to secure the sole plate to the ankle zone at selected positions. Suitably, two co-aligned holes are provided in the ankle zone and sole plate. Preferably, the sole plate is of substantially the same width as the ankle zone. Preferably, the heel portion is also substantially curved suitably on substantially the same radius as the leading end of the toe portion. The upper mounting shin portion of the J-shaped pylon may be secured to a mounting bracket, for example, by any suitable form of releasable attachment means, such as bolts or other suitable fasteners, to enable the upper mounting shin portion to be fixed to a distal end of a leg stump socket. The leg stump socket has a T-shaped bracket attachable thereto. Preferably, the bracket has a top flange, which is fixed to or fixable to the socket and a leg flange to which the mounting portion may be secured. Alternatively, the upper shin portion can be laminated directly to the distal end of the leg stump socket. The prosthetic device of the invention stores energy upon heel strike of the sole plate, with weight applied in the gait cycle, thereby transferring energy during heel strike-forward to mid foot (flat foot) and releases energy at toe-off point of sole plate to provide a stable and controlled propelling lift or thrust to the prosthetic device to aid in achieving a natural gait. The sole plate being fixed to the ankle zone, as described above, is capable of transferring smooth constant energy release from the heel strike through to toe-off of the sole plate during the gait cycle without lag, hesitation, jolting and/or braking, as a result of its one-piece design and fabrication. This is in contrast to prior art devices, such as US Patent No 4,822,363, that incorporate a releasable and attachable sole plate which has to transfer energy release through two separate members (ie. sole plate and pylon) to achieve energy release during the gait cycle. The prosthetic device of the present invention will accommodate angled or uneven terrain without the use of a separate ankle joint through the characteristics of the device that facilitate a continuous smoother transference of stored energy from heel strike through to toe-off. The device may include a plurality of toe and heel sections, wherein each of the toe and heel sections may be buffed to facilitate foot sizing. The prosthetic device of the invention is further capable of minimizing torsional movements and will accommodate stable and controlled lateral medial movements. Increased knee control allows increased ease of roll over of sole plate dissipating inertia and, thus, providing a smoother transition of movement regardless of the intensity of heel strike and mid-strike and toe-off. Preferably, the J-shaped pylon has a shank comprising both the upper shin mounting portion and the lower shin portion that has a uniform thickness and width for all weight categories. It can be cut off where required and adjusted to the wearer without affecting the above stated performance factors. Referring to the drawings and, firstly, to FIGS. 1 and 2, there is illustrated a prosthetic lower limb device 10 having a pylon 11 of generally J-shaped configuration in side elevation and which has an upper shin mounting portion 12, a lower shin portion 13, and a ankle zone 14. As illustrated and as more clearly shown in FIG. 2, the upper shin mounting portion 12, the lower shin portion 13 and the ankle zone 14 are of substantially uniform thickness. There is also provided a sole plate. As best shown in FIG. 3, the J-shaped pylon 11 has a constant width from the upper mounting portion 12 to a point 15. The lower shin portion 13 diverges symmetrically outwards the longitudinal axis of pylon 11 designated by Y-Y, thereby increasing in width to a second point 16, from which the J-shaped pylon 11 continues at a substantially constant width forming ankle zone 14. As shown in figs 1 to 2, the prosthetic lower limb device 10 also includes a T-shaped bracket 18 that has a leg 19 to which the upper mounting portion 12 of the J-shaped pylon 11 can be bolted via bolts 20. The T-shaped bracket 18 also includes a top flange 21 which can be laminated directly to a stump socket 22. Alternatively, the top flange 21 may have a variety of alignment connectors adjoined to it and then connected to the bottom of the stump socket 22 to provide adjustment and angle alignments to fine tune gait movements and complement socket fit. Fixed to the underside of the ankle zone 14 is an integrally formed sole plate 23, which is a one-piece component that incorporates in tandem both the heel portion 17A and toe portion 17. The toe portion 17 is slightly concave on its upper side and extends forward from bolts 26 which interconnect pylon 11 to sole plate 23 while the heel portion 17A is slightly convex on its upper side and extends rearward from bolts 26. The sole plate 23 is substantially the same width as ankle zone 14. There is also provided a sole pad 27. As shown also in FIGS. 4 and 5, there is provided in both sole plate 23 and pylon 11 a series of spaced pairs of co-aligned apertures 24 and 25 to permit the sole plate 23 to be secured to the ankle zone 14 by suitable bolts 26 through aligned apertures at a number of locations. As is apparent in FIG. 5, the leading end of the toe section 17 is of part circular form as is the heel end 17A of the sole plate 23. The above arrangements allow a variety of adjustments for the toe section 17 relative to the heel plate 23 of the prosthetic device 10, thus, permitting the toe section 17 and heel section 17A and sole plate 23 to accommodate subtle variations in the gait. A resilient sole material, such as a rubber or urethane pad 27, may be affixed to the underside of the sole plate 23 covering both the toe portion 17 and the heel portion 17A, and it extends continuously along the entire length of the sole plate 23. The rubber/urethane pad 27 imparts flexibility to the prosthetic lower limb device 10 and helps to absorb heel strike or torque loads that may be applied at the heel or axially along the lower shin portion 13. Further, the rubber or urethane pad 27 also provides energy dampening and increased comfort to the wearer. Typically, the rubber or urethane pad 27 is affixed in position by suitable adhesives. The rubber or urethane pad 27 can act as a non-slip surface to enable the prosthetic lower limb device 10 to be used without shoes. The configuration and design of the main support or J-shaped pylon 11, as described above, enable all stress concentrations to be dispersed more evenly from the shin-mounting portion 12, through the lower shin portion 13 and into the ankle zone 14. The sole plate 23 is designed to provide greater stability and control of medial and lateral and for and aft movements. Furthermore, the prosthesis of the present invention and method of construction also increases the intrinsic strength and durability of the prosthetic lower limb or leg, which facilitates uniformity in a single dimensional design for all weight categories as well as novelty of resiliency rejoinder and return energy of the total prosthesis. It also facilitates distinctive variations of resiliency rates, smoother transition from heel impact to mid-strike to toe-off and allows better torsion movements, which can accommodate the many different exoskeleton and endoskeleton frames, body types and activity requirements of amputees, and a reduction in thigh and lower-back muscle fatigue and strain, compared to other prior art prostheses. The resulting J-shaped pylon 11 preferably has uniformity of thickness that extends from the upper mounting portion 12 and extends through the lower shin portion 13 through the ankle zone 14. The shape of sole plate 23 as shown facilitates smoother controlled toe-off. Furthermore, the configuration and construction of the J-shaped pylon 11 provides effective resilience and return energy of the total prosthesis 10 from upper shin mounting portion 12 through to the ankle zone 14 with the improved process of manufacture avoiding the necessity of prior art prosthesis require a variety of distinctive dimensional (width and/or thickness) pylons, heel plates/sole members to vary their rigidity. Typically, the length of the J-shaped pylon 11 to the lower surface of ankle zone 14 can vary from 255mm to 368mm. This, again, can be heightened through an increase of sole thickness (maximum 20mm), attachment of extension wedges to the top of T- shaped bracket 18 (3cm) and/or extension to the underside of the socket 22 (maximum 7.5cm). These methods of increasing prosthesis lower limb height will not influence performance of the prosthetic lower limb 10. The width of the J- shaped pylon 11 typically increases from 45mm at the mounting portion 12 and diverges outwardly at the point 15 to the position 16 (for a length of 80mm) to a width of 67mm, which then stays constant until ankle zone 14. Typically, the sole plate 23 also has a width of 67mm. The centres for holes 24 in FIG. 5 and holes 25 in FIG. 4 are typically positioned 15mm from the side edges of the sole plate 23 and ankle zone 14, respectively. The holes 24 in the sole plate 23 may be positioned between 90mm and 110mm from the front edge of the plate 23 while the holes 25 in the ankle zone 14 are suitably co-aligned with the holes 24 in the sole plate 23. This will allow for an increase or decrease in foot sizing. It should be highlighted that the above dimensions may be varied. The length of the upper shin-mounting portion 12 can be cut no less than 55mm to point 15 of the lower shin portion as shown in FIG 3 and adjusted to the wearer's requirement without affecting its performance. All of the J-shaped pylon 11 and sole plate 23 substantially have the same thickness, width and other dimensions throughout all weight classes from 30kg to 130kg at 10kg intervals. This is achieved through the novel method of the invention. In the present invention, single-dimensioned mould cavity moulds may be used for the moulding of J-shaped pylon 11 and sole plate 23. Thus, the J-shaped pylon will have uniform dimensions in thickness, in width, shape and sizes for all classes of weight categories. Similarly, the sole plate 23 will also have uniformity in dimensions for thickness, width, shape and sizes for all classes of weight categories. 49 may be formed not only by longitudinal orientation of the fibres (i.e.O0) but also by transverse or latitudinal orientation (i.e.90°) using intermediate pre-preg sheet 48A. FIG. 14 shows the cutting of composite sheet 46 along cutting line 44 so as to provide for intermediate sheet 48B shown in FIG. 15, which is then provided with crease or fold lines 52, 53, 54 and 55. The folding begins with part 58 being folded along fold line 55 as shown by arrow E, followed by part 59 being folded along fold line 54, as shown by arrow F. Subsequently, part 57 is folded along fold line 53, as shown by arrow D, and lastly, part 56 is folded along fold line 52, as shown by arrow C.
Alternatively, part 60 may be folded along fold line 54, as indicated by arrow G, instead of part 59 along fold line 54 as indicated by arrow F. This procedure is further illustrated in FIGS. 16 and 17 to provide a final folded sheet 61 (shown in FIG. 17), from which multiple pre- pregs 62 (shown in FIG. 18) may be cut as shown in phantom in FIG. 17, leaving gaps 65. FIG. 18 also shows a pre-preg 62 having intersecting fibres from the resin-impregnated filaments 30A. The intersecting fibres are from the parts 56, 57, 60, 59 and 58 being folded along fold lines 52, 53, 54 and 55 back upon themselves. Optimum pliability rates, compressive strength, dynamic endurance, fore-and-aft and torsional rigidity in the various weight categories (30-130kg), may be achieved in the J-shaped pylon 11 and sole plate 23 (in FIG.1) by various carbon/carbon or carbon/glass fibre combinations with variations in fibre area weight and fibre orientation. All weight categories (30-130kg) in a preferred embodiment of the invention have the same number of layers of laminates in the construction. The intrinsic characteristics and mechanical strength of the preferred carbon and glass fibres has created a variety of possible configurations in material compositions, fibre area weight and fibre orientations and sequencing to optimise the compressive strength, flexibility, durability, dynamic endurance, fore-and-aft and torsional rigidity in a preferred embodiment. Carbon fibre possesses much higher tensile strength and tensile modulus as compared to glass fibres. However, glass fibres, though less strong, have higher flexibility and fatigue endurance. Higher percentage of carbon fibres and lower percentage of glass fibres in the construction will result in higher stiffness and strength in a preferred embodiment and flexibility will increase with a reduction in tensile strength if we use a higher percentage of glass fibres. Configurations of fibre orientation is another element in the present invention. Typically, placing longitudinal or 0° fibres along and parallel to the principle axis of J-shaped pylon 11 and sole plate 23 will result in very low torsional strength but very high stiffness, very high tensile and high compressive strength. Other fibre angles such, as 30°, 45° or 60° possess much higher torsional strength but lower tensile or compressive strength. It must be highlighted that the intrinsic mechanical properties of carbon and glass fibres are very different from each other and therefore it is natural to expect that their 0°, 30° and 45° angles produce very different results in torsion, tensile strength and compressive strength and this provides more options to configure and to optimise the compressive strength, flexibility, durability, dynamic endurance, fore-and- aft and torsion rigidity of each weight category in a preferred embodiment. 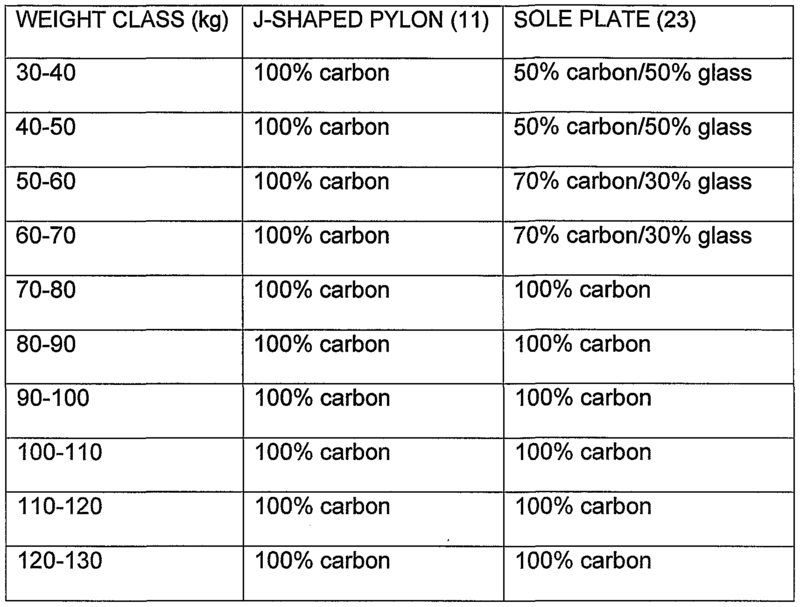 Typical carbon/carbon and carbon/glass compositions for the J-shaped pylon 11 and sole plate 23 are set out in the Table attached hereto. The process of the invention ensures that all the fibres during resin impregnation are thoroughly "wetted" and properly impregnated with the epoxy resin. Typically, this method will produce carbon and glass pre-preg having a resin content range from 35% to 50%. The resin content is higher than most of the commercially available UD pre-preg. The epoxy resin functions as a glue to bind and encapsulate all fibres together. Higher resin content will ensure sufficient resin flow during moulding and will also provide a greater degree of control in the cross linking process, giving a much improved resin/fibre matrix. The result is an increase in strength and durability in a preferred embodiment. All conventional lower limb prosthetic devices are constructed from UD longitudinal fibres in their main core with continuous and uninterrupted woven latitudinal or woven angular fibres on the outer layers to improve their torsion strength. The use of pre-preg 49 (having either 0° or 90° degree fiber orientation) and pre-preg 62 (having other intersecting fiber orientation) in the present preferred embodiment creates a totally new concept and method of construction for moulded products generally inclusive of the lower limb prosthetic device of the invention and is uniquely different from prior art methods. In this present invention, fibre filaments do not have to be continuous and uninterrupted as shown by the method of producing pre- preg 49 and 62. It must be noted that the use of non-continuous fibre filaments constitutes a significant feature of the prosthetic device of the present invention. FIG. 19 refers to the preferred flow chart for the processes of the present invention in relation to manufacture of moulded products inclusive of lower limb prosthetic device. Epoxy resin solution may be formed by mixing the resin, catalyst, additives and solvent in stipulated proportions. The epoxy resin solution may have a 60% to 70% solid content with a cure time of 30 min at 130° degree Celsius and may possess toughness, flexibility, good thermal stability and chemical resistance, and having good bonding strength with the carbon and glass fibres which are the preferred fibres for use in the present invention. This method of the invention allows carbon and/or glass unidirectional pre-pregs to be produced with a wide selection of fibre area weights (ranging from δOgrams to 300grams per square meter), resin content (ranging from 35% to 50% by weight) and fibre orientations and sequencing to be employ and it also provides the flexibility to "choose and optimize" pre-pregs from the various combinations of material compositions, fibre area weight, fibre orientation and resin content that are available. Typically, the carbon and glass fibres used in the preferred method of the present invention, are high strength filaments. The preferred drum wound technique ensures that all the fibres during resin impregnation are thoroughly "wetted" and properly impregnated with the epoxy resin. With adroit control in resin viscosity during the resin impregnation process, it is possible to control resin content within +2%. Controlled and consistent resin content are preferable in the maintenance of compressive strength, durability, dynamic endurance, pliability rates, fore-and-aft and torsional rigidity. The intermediate pre-preg sheets 48A and final folded pre- preg sheet 61 may be subjected to force drying in an oven to remove solvents and any other unwanted volatile components in the epoxy resin. Forced drying also makes the pre-preg sheets less tacky and more suitable for handling in the lay-up process. Suitable oven specifications are temperature of 50-65°C and drying time of 3 to 4 hours. Subsequently after the forced drying process, each intermediate pre-preg sheet 48A and final folded pre-preg sheet 61 may be weighed and cut into pre-preg 49 or pre-preg 62 as appropriate. It must be highlighted that weighing of the intermediate pre- preg sheets 48A and final folded pre-preg sheet 61 after forced drying is a desirable aspect of the process of the invention. This is to segregate pre- pregs that falls in the high or low end of the resin content range, and to combine these pre-pregs appropriately so that the weight of the moulded J-shaped pylon 11 or sole plate 23 remains relatively constant. As an example, a pre-preg having high resin content may be used in conjunction with another that has low resin content during lay-up process. After the lay-up of successive layers of pre-preg 49 and pre- preg 62 in the respective compression mould cavity, the compression mould may be heated to 135°C-150°C (and more preferably 140°C) suitably in combination with a hydraulic pressure of 200 kg/cm2 using a 200mm diameter hydraulic piston. After curing, de-moulding is undertaken to remove the moulded members, which are then prepared for assembly and final cosmetic treatment. It will be appreciated from the foregoing that in view of the fact that the moulded product of the invention can be made from a mould cavity of similar dimensions regardless of weight that this feature will also apply in a preferred embodiment to the moulded product of the invention such as the J shaped pylon or the sole plate. It therefore will be appreciated from the foregoing that the process of the invention provides a lower leg prosthesis which has considerable advantages over the prior art as will be apparent from the foregoing description. A preferred method of lay up or sequencing of both pre- pregs 49 and 62 is described below in relation to manufacture of a J shaped pylon. 20 layers of 0° and 90° fiber combination. 40kg to 50kg - pylon 345g ±5g, 38 layers of 60° fiber and 20 layers of 0° fiber combination. 50kg to 60kg - pylon 345g ±5g, 38 layers of 45° and 60° fiber combination with 20 layers of 0° and 90° fiber combination. 60kg to 70kg - pylon 345g ±5g, 38 layers of 45° and 60° fiber combination and 20 layers of 0° fiber. 70kg to 80kg - pylon 345g ±5g, 38 layers of 45° and 20 layers of 0° and 90° fiber combination. 80kg to 90kg - pylon 345g ±5g, 38 layers of 45° and 20 layers of 0° fiber. 120kg to 130kg - pylon 345g ±5g, 38 layers of 30° fiber and 20 layers of 0° fiber. 110 to 120 kg - 36 layers of 30° and 45° carbon fiber combination with FAW 100 at 0.12mm, 16 layers of carbon fiber 0° with FAW 150 at 0.15mm 120 to 130 kg - 36 layers of 30° carbon fiber with FAW 100 at 0.12mm, 16 layers of carbon fiber 0° with FAW 150 at 0.15mm. 2. A method as claimed in claim 1 wherein in step (a) use is made of a drum winding technique whereby said impregnated fibres are wound onto a drum so as to provide an intermediate composite sheet formed of the fibres supported on a sheet of release paper on the drum, whereby upon removal of the release paper, the sheet formed by step (a) is obtained by cutting the intermediate sheet as it is supported on the drum. 3. A method as claimed in claim 1 wherein use is made of a hot melt technique wherein after hot melt resin impregnation of the fibres they are laid onto a continuous sheet of release paper and subsequently stored as rolls. 4. A method as claimed in claim 1 wherein in step (a) the sheet has all of its fibres arranged in the same or similar orientation or direction. 5. A method as claimed in claim 1 wherein in step (b) each pre-preg has all of its fibres arranged in a longitudinal orientation. 6. A method as claimed in claim 5 wherein in step (b) after a folding step each pre-preg have all of their fibres arranged in an intersecting orientation. has sloping sides having the relevant angle to vertical before folding of the final sheet upon itself to form said pre-preg. selected from 30° and 45°. 9. A method as claimed in claim 5 wherein in step (c) successive layers are formed of pre-pregs having fibres arranged in an intersecting orientation which alternate with pre-pregs having fibres arranged in a longitudinal and/or latitudinal orientation. 10. A method as claimed in claim 1 wherein the intermediate sheet is formed by longitudinally and/or latitudinally oriented fibres so as to provide a sheet which is in the shape of a rectangle or square. pregs of intersecting fibres and 0° for pre-pregs of longitudinal and latitudinal fibres. 12. A method as claimed in claim 1 wherein step (d) is carried out in a mould cavity having the same dimensions for different weights or different weight categories of moulded product. 13. A moulded product characterised in that said moulded product is formed from composite materials having layers of non-metallic fibres impregnated with an epoxy thermosetting resin, characterized in that said moulded product is formed at least partly from layers of non continuous or cut fibres wherein at least some of the fibres are arranged in an intersecting orientation. 14. A moulded product as claimed in claim 13 in the form of a pylon. 15. A moulded product as claimed in claim 13 in the form of a J shaped pylon. 16. A moulded product as claimed in claim 13 in the form of a sole plate. 17. A moulded product as claimed in claim 13 in the form of a combination of a J shaped pylon attached to a sole plate so as to define a lower limb prosthetic device. 18. A moulded product as claimed in claim 13 wherein the pylon at least in outer extremities thereof is formed from a laminate of alternating layers of said intersecting fibres with layer(s) of said fibres arranged in longitudinal and latitudinal orientation. 19. A moulded product as claimed in claim 15 wherein the J shaped pylon has an upper shin mounting portion, a lower shin portion and an ankle zone. 20. A moulded product as claimed in claim 19 wherein the upper shin mounting portion has a substantially constant thickness and width. 21. A moulded product as claimed in claim 19 wherein the lower shin portion has a width that diverges outwardly as it approaches the ankle zone. 22. A moulded product as claimed in claim 19 wherein the ankle zone at or approaching a lower or free end thereof has a slight concave curvature. 23. A moulded product as claimed in claim 16 wherein the sole plate is of substantial width compared to an ankle zone of the J shaped pylon. 24. A moulded product as claimed in claim 16 wherein the sole plate has a heel portion and a toe portion. 25. A moulded product as claimed in claim 23 wherein the sole plate has a heel portion and a toe portion and the heel portion has a complementary or corresponding curvature to the ankle zone where they abut each other. 26. A moulded product as claimed in claim 13 which has substantially the same dimensions and shape regardless of weight. 27. A pre peg having a plurality of resin impregnated non metallic fibres which are all orientated in a direction parallel with each other wherein at least some of said fibres have been cut to have a similar length. 28. A pre peg having a plurality of resin impregnated non metallic fibres which have been cut to achieve an orientation whereby at least some of the fibres intersect with each other. CH710914A1 (en) * 2015-03-26 2016-09-30 Convergence Composite Sa A method of manufacturing a micromechanical component anisotropic.